A dairy equipment specialist says farms are continuing a transition to robotics despite the current milk price environment. Mark Futcher with DeLaval tells Brownfield researchers have estimated by 2025 a majority of cows will be milked automatically. “It was preconceived, wrongly it seems, that robots would only have a fit for smaller farms, whatever that might be defined as, fast forward to today where we’re talking to some of the larger and very largest dairy producers in North America about robots.” He says the shift toward robotic milking parlors is happening globally and with all sized dairy farms as a way to improve labor costs, productivity and cow comfort. 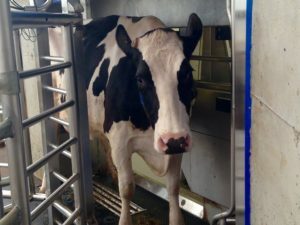 During World Dairy Expo, TDI Farms LLC of Westphalia, Michigan announced plans to build the largest DeLaval robotic dairy in North America with 24 robots and this past June the company finalized an agreement to equip the world’s largest robotic dairy in Chile which will milk 4,500 cows with 64 robots.